Today we were cleaning out linens and uncovered my first quilt. It is a simple 9-patch class that I took at Keep Me in Stitches when we were living in Tampa, FL. (I had the idea that choosing a big, vibrant patterns would hide my lack of technical skill. I think it worked! And I still love bold patterns.) The binding makes me laugh. Coming from a needlework background I clearly didn't understand that binding stitches are not actually supposed to show - mine travel right over the top of the fabric. I am a big believer in trying new things. When we push ourselves out of our comfort zone, either artistically or technically, we grow as individuals and so does our work. I have enjoyed parlaying many of the technical skills that I have picked up from others into my personal sewing and artwork, sometimes in ways that I least expect. Many students come into classes a bit nervous and unsure of their skills; they are usually the most enthusiastic and excited when they take a risk and dive into a project. So, if there is a project or skill that you have been wanting to master jump in! Life is short and fabric forgiving. i am a recent follower of your blog cause I saw your new fabric collection (mocha)and am so in love with it. I was reading all your blog post and had to comment when I came to this post. my first quilt was also a 9 patch quilt that I made for my boyfriend. 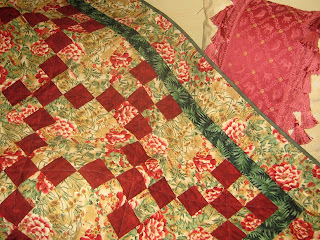 I am self-taught and figured the best way to start quilting was do what your already know; sew in a straight line. 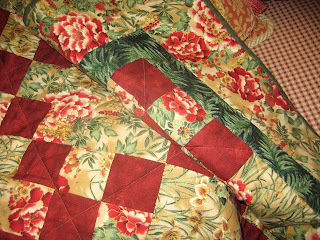 Found the 9 patch pattern in some quilting book and we still use the quilt today. keep up the beautiful designs. can't wait for more!